Desaru trip is coming! Just a few more days to Good Friday, when I would join LoveCyclingSG for a cycling trip to Desaru. Finally found some time to buy degreaser today, so that I can go clean my chain properly. Called up Rodalink to check if they have those kind in a bottle that can be poured out, instead of those sprayed on type. Unfortunately all the Rodalink stores nearby had run out of stock on that. Had to go all the way to Gee Hin Chan at Bugis to get degreaser. Reached home and wanted to clean the chain, but the first thing I noticed was that...the tire was flat AGAIN! The front tire was flat, super sian diao. My first thought was that it must have been punctured by a stone or something. In fact the bike was fine just a few hours ago, because I had just rode it home last night at 1am after watching Arsenal vs Liverpool. Found a small stone embedded in the tire, as seen below. Flat tire with stone embedded in tire. Took a sharp pin to dig it out, and it came out easily without much prodding. Next was the most dreaded part, fixing the flat. The problem is that the tire fits very tightly around the rim, which makes it extremely difficult to remove or put on the tire, even with tire levers. This tightness is in part due to the extra rim tape that was put on previously, when I had a problem with flats happening for no reason. See the previous post here. Spent like 10mins wrestling with the tire before finally getting it off. I can't use too much strength for fear of damaging the rim or the tire bead, but without using strength it is impossible to pry the tire off. Pulled out the tube and pumped it up to see where the puncture was. 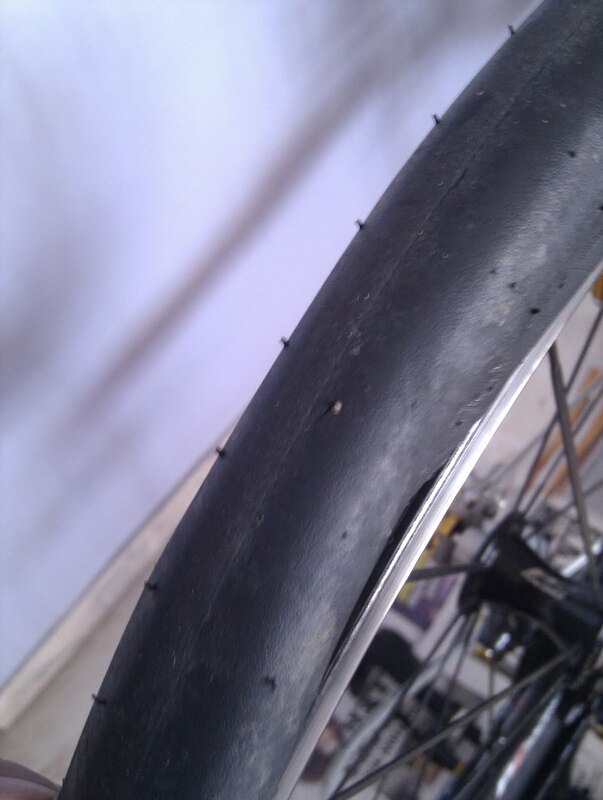 Found that the puncture was not on the outside, as suspected earlier. The stone which I earlier found embedded in the tire actually did not penetrate the tire and puncture the tube. The puncture was actually on the inside, the side of the rim tape. Exactly the same problem as before. This time its even more worrying because it still happened even with the extra layer of rim tape! Checked the layer of rim tape very carefully, and found absolutely no visible holes. At this point I suspect the problem might be with the tubes. Maybe there is a defect in the tubes that makes it vulnerable to punctures. By the way, these are "good" quality Schwalbe tubes that cost $11 each. 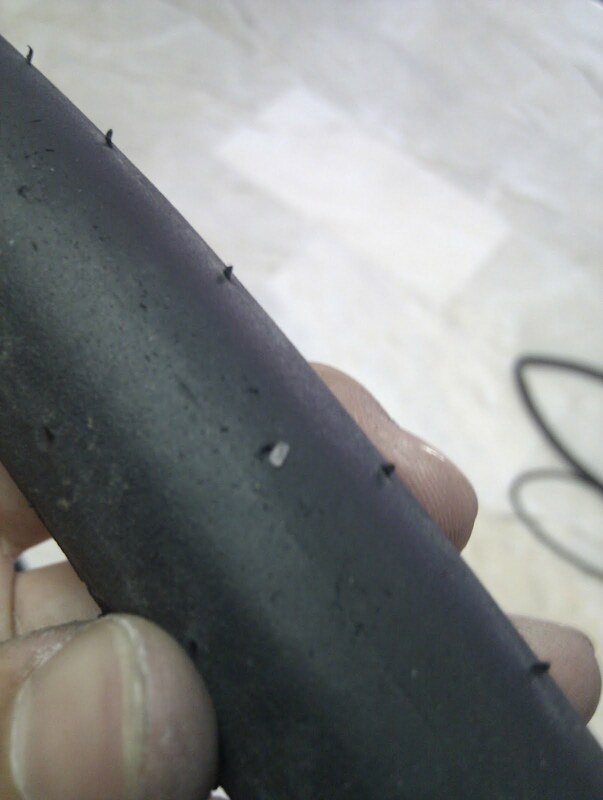 Before going on to put in a fresh tube, I decided to check the surface of the tire for more embedded stones. In fact I found a lot of stones! One of the many stones found embedded in the tires. As seen in the picture above, there are many small cuts on the surface of the tire, some of which still has a stone inside. In total, I found at least 8 such stones of this size, and many more smaller ones! I am not exaggerating; there would be quite a visible pile if I had gathered all the stones together. It is quite shocking when you suddenly realise that you have been riding around with all these stones in the tire, yet did not get a single puncture while riding. This proves just how good the Kevlar RaceGuard used by Schwalbe is. So many sharp stones, and none of them managed to penetrate the kevlar layer. Quite amazing. On the other hand, the tubes are not so good, and all my punctures have actually happened while I was not riding, and the bike was just sitting at home. I have confidence that the tire will not be punctured easily by external debris, but I fear that the tube will be punctured from the inside. Hopefully it will not happen again, especially not when I am riding in the middle of nowhere. By the way it took a lot of effort to put the tire back on the rim again. Took me like 30mins to change a tube, which is far too long. Much of the time was actually spent wrestling the tire on and off the rim. On a happier note, I managed to get the chain sparkling clean by using the degreaser to clean the chain. 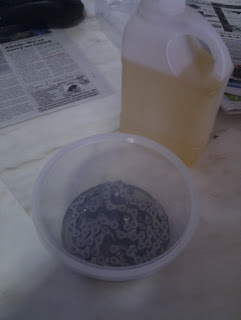 As shown by Taiwoon during the bike demo, the chain was placed in a container with some degreaser, and then shaken to wash off the dirt. In the background is the bottle of degreaser which I bought from Gee Hin Chan for $15. 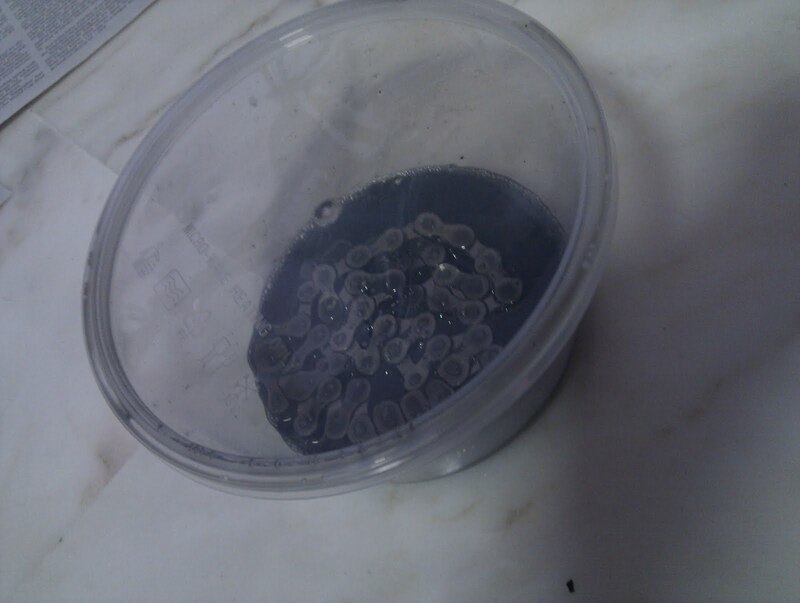 I am using a cheap disposable plastic container, so that I will not have to wash it after use. After some shaking, the degreaser turns very black. Only a little degreaser is needed as the shaking will ensure that the degreaser washes the dirt out from every corner of the chain. It is best to do the shaking in the bathroom or outside the house as the container may leak. 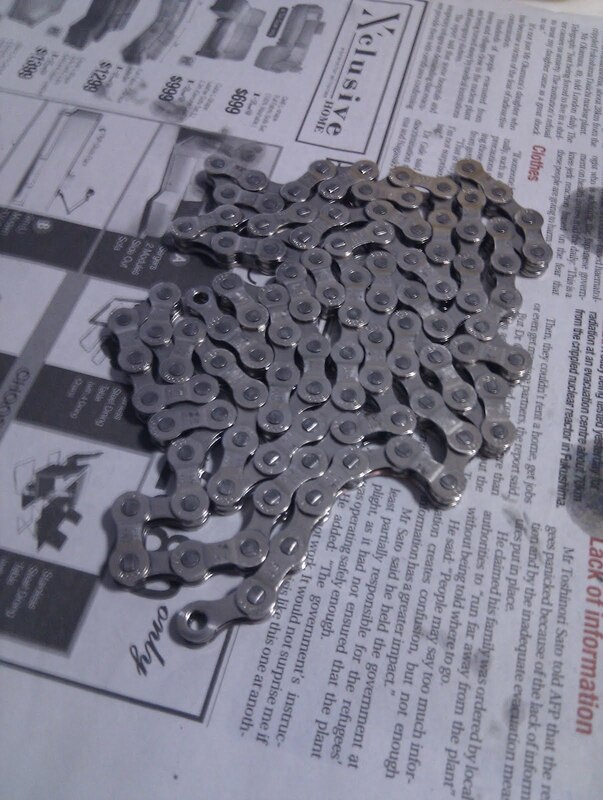 Pulled out the chain and dried it with some rags, before placing it on some old newspapers for it to dry. It is important to leave it there for a while, so that all the degreaser evaporates. If chain lube is applied immediately, the degreaser will just neutralise the lube and there will be no lubrication for the chain. Currently, the front tire is pumped up to 80 PSI. I will leave it for a few days, and hopefully it does not get punctured for no reason again. Now I got to go get myself some more spare tubes for Desaru. Nice and shiny chain, easy to do right? Good to check the bike before a long ride! See u on Friday! good job. I'm yesterday just go get a new chain. but no time to change yet... thanks for your help on Sunday! Ok, a stupid question - how do you get the chain out? @David, no problem, glad to help! @YSL I'm using a SRAM chain, with a powerlink, so its very easy to open the chain without tools. i love the orangey smell of degreaser. haha.